I often like to find ways to visualize the essential steps of the solution-focused model because I have found that many people tend to find these to be very helpful. One of the ways I have found is the Pathways to solutions model which was developed by Walter and Peller in 1992 (who in turn, I guess, were inspired mainly by earlier models by Steve de Shazer). I made this powerpoint slide of the model. I changed rather many of the terms though and also bit of the structure, so don't blame Walther and Peller for any mistakes. 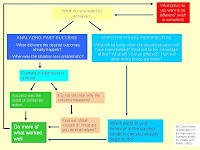 You may use this model to help yourself find solutions to problems and you can also help others solve their problems by guiding them through the steps. This is work in progress. If you have any suggestions to improve this model, let me know. Do you know of other interesting visualizations of the solution-building model, also let me know.